In a time full of comic-book movies, one would think that studios would pillage the vast amount of characters turning every single one of them into a movie. While Disney/Marvel are, in a way doing that, Sony Pictures rather wants to give us the sixth Spider-Man film. But it wouldn’t be 2017 if it just were the sixth installment of one series. No, it’s the first movie of the third iteration of the immensely popular character. Well, technically it’s the second movie since this version of the character had its debut in 2016’s “Captain America: Civil War”, but one cannot be blamed for losing track of such things these days. Musically, the web-slinger went through a whole gallery of composers and styles. Funnily, the most referenced theme is, just like with Batman, from a 60s cartoon-show. In the case of Spidey, it was composed by Paul Francis Webster and Robert Harris. Then came the Raimi-trilogy from which the first two entries got scored by the then go-to superhero composer Danny Elfman. Afterwards Christopher Young, who also wrote additional music for the second film, took over for “Spider-man 3”. There was a whole lot of additional music by John Debney and others in the third film as well. This trilogy of scores, despite the third one still being unreleased due to the chaos on the cue-sheets, is probably the one which connected most with the masses, Elfman’s main theme being a fan favorite, supported by very strong villain themes, most notably the awesome one for Doc Ock. When Sony decided to reboot the series in 2012, James Horner took over the eight-legged baton and wrote, what essentially is kind of a “Best-Of Album” of “Hornerisms”, though without the danger-motif. It may have lacked any memorable material for the villain, but the catchy main theme and tasteful mixture of piano, orchestra, and electronics made up for it. Then Horner left for the sequel and Hans Zimmer entered the stage with his super-band, the “Magnificent Six”, and because thematic continuity is for sissies, Horner’s stuff got ditched. On the plus side of things, we got, what yours truly considers to be the best superhero-score to date. A brilliant mix of indie-rock tendencies, aggressive dubstep and more traditional orchestral writing full of amazing themes and great interplay. Alas, the film flopped and Sony had to restart the franchise once again and turned to Marvel Studios, working out a deal which allowed Spidey to appear in the Marvel Cinematic Universe, starting with the mentioned appearance in “Civil War”. The composer of that film, Henry Jackman did write a short motif for Spider-Man, but it proved itself so boring that it got thrown out of the window for the first solo-movie of the all-new Spider-Man. Tom Holland being the title character, after Tobey Maguire and Andrew Garfield in the previous versions. Although to be fair, this could also be due to the MCUs tendency to not care for overarching character themes. Be that as it may, scoring-duties for the film went to Michael Giacchino, who previously wrote the soundtrack for “Doctor Strange” in 2016 and what we got now is truly a worthy successor to the already splendid track record of Spider-Man soundtracks. If one were to describe “Spider-man: Homecoming” in one word, it would be “fun”. Because the whole album is really that: A great deal of fun. Giacchino chose to stick mostly to a more traditional, orchestral sound-palette for the film, ditching the synthesizers of “The Amazing Spider-man” soundtracks, but still manages to distance himself from Elfman’s trilogy. That achievement stems from the percussion section. Prominent rolling timpani’s, and an energetic collection of all kinds of metal things to hit with drumsticks (“No Vault Of His Own”). The other important, unique-aspect is the strong reliance on plucked strings, be it the typical string-section of the orchestra or guitars, electric and acoustic. The latter idea connects to Giacchino’s intent to address the character’s youthful naivety and clumsiness since Holland is the youngest version of the character we have yet seen on screen, while also fulfilling the popular musical cliché to represent arachnids with the aforementioned type of sounds. The actual main theme also supports that notion. While it does get its heroic moments, they come pretty late in the score, since the character still has to grow into the hero we know him as. Most of the time, especially in the first half, it’s just clumsy in the most lighthearted, optimistic kind of way. The third track, “Academic Decommitment”, which introduces the theme, is just a perfect example of that. It’s great comedic writing without falling into overbearing “mickey-mousing” or slapstick. Conceptually, the main theme has another surprise in store, since it’s actually a kind of re-imagining of the 60s cartoon theme. At some points, Giacchino makes that connection very obvious through deceiving his audience with the opening three string-notes of the original theme, before having his own theme played instead. It’s basically the same concept he used on the “Hope” theme from “Rogue One”, but this time he actually pulled it off. Jump to 3:30 of “Vulture Clash” to find it. Opposed to the main theme stands the theme for the villain, Michael Keaton’s winged Batman Birdman Vulture. His main theme is a bold, brassy melody over aggressive timpani, that gets introduced right near the ending of the second track “The World Is Changing”. It’s a tad simplistic and could honestly belong to many villains, but in 2017, one should be happy for any villain theme that’s not just a screeching noise. Hear “Pop Vulture” or “Vulture Clash” for other neat statements of it and especially “Fly-By-Night Operation” for some really good interaction between his theme and Spidey’s. “High-Tech Heist” even has a subtle variation of the Vulture theme on lamenting strings to hint at his not-so-happy backstory, but if you want just big evilness, “A Boatload Of Trouble Pt. 2” might be more to your liking. That one also showcases the villain’s secondary material quite well, described by Giacchino himself as a “cluster”, “[…]this rhythm thing, with low strings on different notes”. These clusters are put to great use in “Drag Racing/An Old Van Rundown”, which has awesome percussion, guitar-work and powerful low brass. Said brass also can be marveled at in “Bussed A Move”, which provides typical great action-writing as Giacchino enthusiasts know and love it. This is all well and good, but fortunately, the score also knows how to entertain when it’s not about larger-than-life characters battling each other with crazy superpowers, the composers varied orchestrations make sure of that. “On A Need-To-Know Basis” for example starts with a wailing electric cello reminiscent of many Remote-Control scores, like the Daenerys material in Djawadi’s “Game Of Thrones”, before heading off into pizzicato strings gleefully performing the main theme. Or “Webbed Surveillance” with its forceful trombones, plucked electric guitar for extra-coolness and dynamic drum-kit under the main theme on clarinet. It subtly brings up memories of 60’s spy-films. Speaking of the clarinet, some of the woodwind writing is exceptional, like amidst the crazy brass action in “A Boatload Of Trouble Pt. 2” or the last minute of “A Stark Contrast”. In fact, that entire cue is a blast: From the cameo of Silvestri’s “Avengers” theme over warm strings leading into a solemn brass statement of the main theme, before a quiet harp takes on the theme to a delicate, short piano solo before spirit of youth returns with all kinds of plucked strings and those aforementioned skillful flute accents. Not to be forgotten is the guitar work. While there are no real soli, like in Zimmer’s take on the character, tracks like “Baby Monitor” and “Stark Raving Mad” still do a great job of showcasing what can be done with the instrument, the former being more cool and electric, while the latter focuses on the acoustic side, almost sounding like a full song will follow. The album closes with the eight-minute long “Spider-Man: Homecoming Suite” which is just what you want from a suite. It has some wonderful variations of Spidey’s theme on brass and pizzicato strings alike, a powerful burst of Vulture’s theme and then the beautiful love theme, which sadly gets kind of lost in the rest of the score with the other really noteworthy appearance being the piano solo in “A Stark Contrast”, so you can’t be faulted if you don’t notice it at all. The quirky violin in the last few purely instrumental seconds is really the icing on top. As already said in the beginning, Michael Giacchino gave the character of Spider-Man yet another captivating score. It’s full of life, fun and never boring for even a second. There just has to be one flaw to be pointed out: Thematic continuity. While it’s awesome that the theme for the Avengers returns (besides from the cue already mentioned, it also opens up the actual score) and while the throwback to the TV theme in that opening cue is indeed great, it’s borderline infuriating that Tony Stark/Iron Man’s past in the MCU doesn’t get musically addressed. The character is already the preferred target for complaints directed at the MCU’s music department since he now has had 3 different themes with none carrying over to a following film and HOMECOMING doesn’t even try to change that. There is no hint of either Djawadi’s, Debney’s or Tyler’s theme. Whether that was because the studios or the producer didn’t let Giacchino use them or whether he himself didn’t care for them, the fact that neither appears is inexcusable. In fact, Giacchino was bold enough to write yet another theme for the character. It won’t jump out on you on the first few listens, but it’s there and can best be heard at the 1:50-minute mark during “Ferry Dust Up”. To be fair, it is not a bad theme and fits the character rather well, but there is no reason for a new theme to be there. But aside of that nuisance, “Homecoming” is still a great score with an earworm as the main theme that will entertain you for quite some time. It’s nice to know, that no matter how dark and edgy modern blockbusters get, Spider-Man still is determined to just give its audience some fun, no matter what installment we’re talking about and “Homecoming” is no exception. 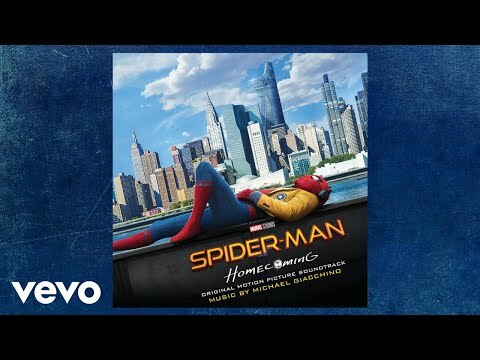 1 Comment on "Spider-Man: Homecoming by Michael Giacchino – Soundtrack Review"